For every successful studio, there comes a time when you feel as if you’ve outgrown your first space and are ready to offer more for your customers, whether it’s additional parking or showers or a larger class space. But once you know you’re ready to expand and you have your budget and funding in place, then what? Below, we share our advice and timeline for finding the perfect studio space to fit your needs. You’ll never forget the connection you felt to your first studio space, but there’s also bound to be some things that you don’t love about it. When thinking about what you want versus what you need in a new studio space, consider what’s lacking in your current space. Do you wish you were able to have a larger lobby and check-in area for clients? Would you like to be more centrally located or near public transit? Now, let’s assume you know exactly what you want and you’re ready to start looking. First, find a broker you can trust who’s ready to do your bidding for you and negotiate with the landlord on your behalf. Ask your friends or fellow connections in the fitness space about who they’ve worked with or if they have recommendations from past experience. You also must have someone with expertise in your geographic area and retail leasing — special bonus if they’ve worked with studios/gyms in the past — and who can provide you with transparency into the real cost of taking on a particular lease, not just the price per square foot. It may take anywhere from 1-4 months to find a space — or longer! 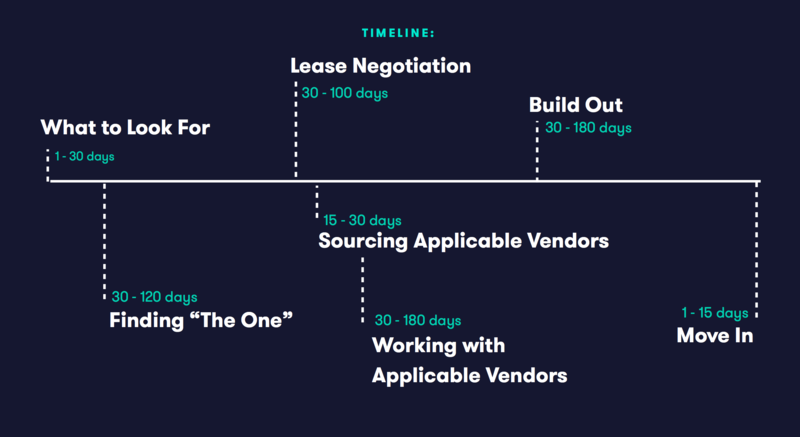 Be patient with the process and don’t rush it, because you’ll likely need to commit to the space for anywhere from 5-10 years at minimum, unless you’re signing a subleasing agreement. Once you’ve found the space — and after you’ve done a celebratory dance! — you’ll also want to budget at least a month for negotiating the lease. Contract the services of a real estate lawyer to review the lease on your behalf (they can be over 100 pages with tons of hidden details) so that you make sure your own interests are protected. At the same time you’re working through the lease negotiations, you’ll want to start contacting vendors to help build out your perfect studio space. Know that, going in, no retail space you see will be exactly what you’re looking for and that there will be customization in store to make it fit your brand needs and style. Your landlord may offer some money towards making those improvements, so be sure to check on that before starting work. Note, however, that no work can start until the lease is officially signed, yet it’s always a good practice to start lining contractors up ahead of time to ensure that work can be completed on your schedule. Just like you did with your broker, ask around in your community and network for recommendations for contractors. Contrary to what you might think, the landlord is also a good resource to tap into, as he/she likely has vendors that he/she regularly works with, which can ease some confusion or miscommunication that naturally can arise in these types of situations. Depending on the work you’re doing, you may need a general contractor, an architect, an engineer, an electrician or IT/AV consultant, which is a lot of moving parts to coordinate. Throughout the build out process, request weekly or twice weekly progress reports and regular in-person check-ins with all stakeholders to ensure communication is clear between all vendors and that everything is moving according to schedule and budget. Before you know it — or maybe six+ months later — you’ll be in a new space fit to grow your business and welcome more clients. Check out our webinar, Building a New Studio Space, to get even more insights and tips on finding and building out your perfect studio space.